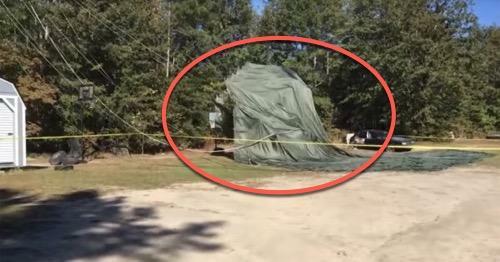 A Boeing C-17 Globemaster military transport plane accidentally dropped a Humvee onto a community in Harnett County, North Carolina, Wednesday afternoon, Fort Bragg officials confirmed. 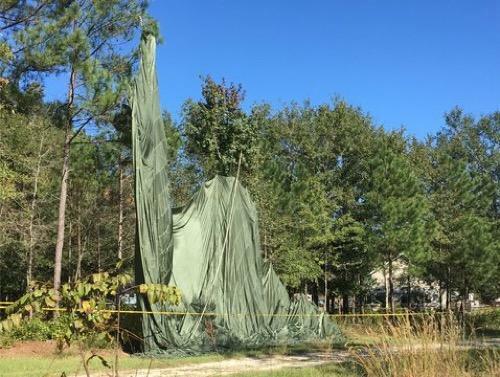 The incident occurred around 1 pm in the small town of Cameron, which CNN said the Humvee landed approximately seven miles north of the intended Fort Bragg drop zone. Tom McCollum, Fort Bragg spokesperson, said the plane was several miles from the military installation, flying at an altitude of 1,500 feet when the Humvee prematurely dropped. "We don't know what happened, but the platform went out early and landed in a rural area. There was no one hurt. No property was damaged," McCollum said. He said all three parachutes opened, and the vehicle landed between two homes on Walter Lane, off Gilchrist Road, which is between Jacksonville and Spout Springs. "It sounded like a car crashing," Grant said. "When it happened, my wife and I went to see. We saw a parachute laying on the road." Grant called 911 because he thought a soldier(s) might have had a bad jump. "That's when everybody came," Grant said, referring to firefighters, law enforcement, and the military. "A few moments later, they [first responders] told us there might be explosives and had us all move back." Bobby Brown and his wife live down the street from the incident. The Browns saw parachutes coming down behind family member's home. The Humvee ended about 300 feet behind the house. 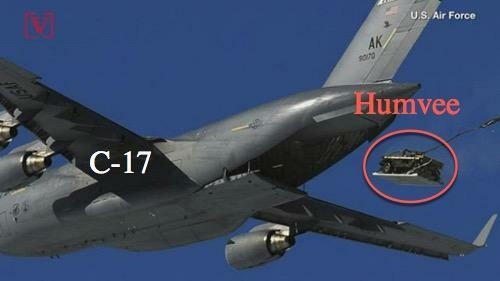 The C-17 Globemaster was conducting a heavy drop from the 437th airlift wing based at Joint Base Charleston, McCollum said. The unit specializes in testing new equipment and procedures to support the aerial transportation unit of the military. It is evident that either new equipment or human error was at play. The incident is still under investigation with the National Transportation Safety Board currently heading to the scene to get to the bottom of this massive failure that could have had civilian casualties.